Join us at our JAM Sessions and dance to the beat, play an instrument and experience something unexpected with these FREE interactive events. Unleash your inner artist through singing, dancing and playing music under the guidance of professional artists. 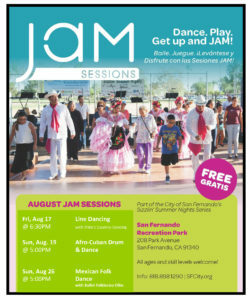 Presented by the Ford Theatre Foundation in partnership with the City of San Fernando, JAM Sessions are generously supported by The James Irvine Foundation. Additional support is provided by the Office of Supervisor Sheila Kuehl, Los Angeles County, Third District; Department of Cultural Affairs, Los Angeles; National Endowment for the Arts; Wells Fargo Foundation; Southern California Edison; SonyPictures; Employees Community Fund of the Boeing Company; Macy’s; NBC Universal; and Union Bank Foundation. Wear comfortable clothes and shoes. JAM Sessions are participatory and centered around movement and music. All JAMs are FREE, and all ages and skill levels are welcome.